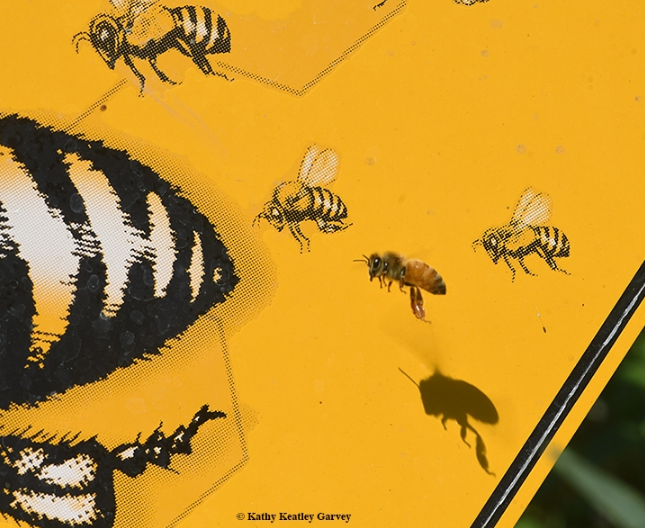 A "real" honey bee flying alongside "fake" bees on a bee crossing sign. We photographed this honey bee (below) at 1/1000 of second (with a Nikon D500 and a 105mm lens with the f-stop set at 16 and ISO at 800), but honey bee flight is truly amazing. Back in the 1934 French scientists August Magnan and André Sainte-Lague calculated that honey bees shouldn't be able to lift off, much less fly at all. However, they presumed bee wings are stable, like airplane wings, when in fact, they're not. Honey bees flap and rotate their wings some 240 times per second, according to research, "Short-Amplitude High-Frequency Wing Strokes Determine the Aerodynamics of Honeybee Flight," published in December 2005 in the Proceedings of theNational Academy of Sciences (PNAS). The researchers, from the California Institute of Technology, pointed out that a fruit fly is 80 times smaller than a honey bee and flaps its wings 200 times each second, while the much larger honey bee flaps its wings 240 times every second. To stay aloft, a honey bee uses short wing strokes of less than 90 degrees and a high number of flaps. "This flapping, along with the supple nature of the wings themselves, allows a bee--or any flying insect, for that matter--to create a vortex that lifts it into the air," explained David Biello in a Nov. 29, 2005 piece in Scientific American. Or, technically, as the researchers wrote in their abstract: "Most insects are thought to fly by creating a leading-edge vortex that remains attached to the wing as it translates through a stroke. In the species examined so far, stroke amplitude is large, and most of the aerodynamic force is produced halfway through a stroke when translation velocities are highest. Here we demonstrate that honeybees use an alternative strategy, hovering with relatively low stroke amplitude (≈90°) and high wingbeat frequency (≈230 Hz). When measured on a dynamically scaled robot, the kinematics of honeybee wings generate prominent force peaks during the beginning, middle, and end of each stroke, indicating the importance of additional unsteady mechanisms at stroke reversal. "When challenged to fly in low-density heliox, bees responded by maintaining nearly constant wingbeat frequency while increasing stroke amplitude by nearly 50%. We examined the aerodynamic consequences of this change in wing motion by using artificial kinematic patterns in which amplitude was systematically increased in 5° increments. To separate the aerodynamic effects of stroke velocity from those due to amplitude, we performed this analysis under both constant frequency and constant velocity conditions. The results indicate that unsteady forces during stroke reversal make a large contribution to net upward force during hovering but play a diminished role as the animal increases stroke amplitude and flight power. We suggest that the peculiar kinematics of bees may reflect either a specialization for increasing load capacity or a physiological limitation of their flight muscles." Close-up of a returning foraging bee sharing nectar with her sisters. 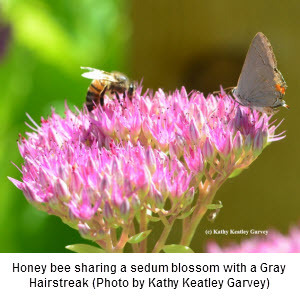 (Photo: Kathy Keatley Garvey)Take it from the bee scientists. Honey is NOT vomit. We can. Mark your calendar to attend these two events: the second annual California Honey Festivalon May 5 in downtown Woodland (it's held in partnership with the UC Davis Honey and Pollination Center) and the fourth annual UC Davis Bee Symposium: Keeping Bees Healthy (hosted by the Honey and Pollination Center and the UC Davis Department of Entomology and Nematology) on March 3 in the UC Davis Conference Center. The Bee Symposium will feature keynote speaker Thomas Seeley, the Horace White Professor in Biology at Cornell University, New York. Sarah the Bee Girl stands in front of a cluster of first graders sitting by a six-foot worker bee sculpture in the UC Davis Häagen-Dazs Honey Bee Haven. Her name is Sarah Red-Laird, and she is here to present an interactive educational program involving bees and beekeeping, honey, beeswax and bee habitat to students from Peregrine School, Davis. It's part of her "Bees and Kids" program, funded by the American Beekeeping Federation's Foundation for the Preservation of Honey Bees. She's speaking to them as part of the Western Apicultural Society's 40th annual conference, Sept. 5-8. The students are super excited. Holding up fruit after fruit, she asks if they like strawberries, apples, oranges and lemons, all bee-pollinated. They eagerly raise their hands. She tells them that bees are responsible for providing one-third of the food we eat, including fruits, vegetables and nuts (almonds). Our shopping carts would be sparse if there were no bees, she says. She quizzes them about grapes, rice and oats, which are not bee-pollinated. Then she turns to honey. "How much honey does a bee make in her lifetime?" she asks. "Is it 1 cup, 1 teaspoon or 1/12th of a teaspoon? if you think it's one cup, raise your hand." Half a dozen hands shoot up. "If you think it's one teaspoon, raise your hand." A few more raise their hands. "If you think it's 1/12th of a teaspoon, raise your hand." One person responds. "The correct answer," says Sarah the Bee Girl, "is 1/12th of a teaspoon. That's how much a honey bee makes in her lifetime." "I guessed that!" yells a little girl. "Did you?" Sarah asks, approvingly. "You're a smartie," she praises. "We didn't," a boy laments. 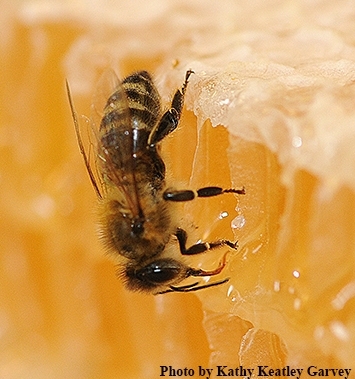 A honey bee seeking drips from the bottled honey at the "Kids and Bees" honey-tasting event. (Photo by Kathy Keatley Garvey)Sarah drives home the point with: "That means that honey bees work really, really hard for the honey we eat. For me, I eat it every day." Sarah continues. "How many flowers does it take the bees to make one pound of honey?" she asks, holding up a jar of honey. The students respond with answers that range from 99 to 100 to 200 to 1000 to 2000 to 8000 to 1 billion. "The correct answer is 2 million," she tells them. "it takes 2 million flowers to fill this one jar of honey." Sarah drives home the point with: "The best thing to do to help bees is to plant flowers. Let's say it all together. what can you do to help bees? Later she reads a book and then asks them to answer questions about nurse bees, house bees, scout bees, guard bees, queen bees, foragers and drones. Each person who answers the question correctly is adorned with props depicting that bee. The first graders love it! They gigle, laugh and cheer. Next they move in small groups to the educational stations where they taste honey, learn about bee habitat and bees wax, and see honey bees and other bees up close. It's obvious that Sarah loves bees and wants others to love them, too. Sarah says her love of bees began in Southern Oregon, on the deck of her aunt's cabin, at the end of a country road. She received her degree, with honors, in resource conservation from the University of Montana and did research in Jerry Bromenshenk Honey Bee Lab. She presented her beekeeping findings at the National Conference on Undergraduate Research on "How to Keep 100,000 Girlfriends, the Careful Relationship of a Beekeeper and Her Honey Bees." Today she's the program director of the American Beekeeping Federation's "Kids and Bees" Program and executive director of Bee Girl, a nonprofit organization: its mission is to inspire and empower communities to conserve bees, their flower and our food system. She serves as the Oregon director of the Western Apicultural Society, a member of the New York Bee Sanctuary Advisory Board, and the regional representative to the Southern Oregon Beekeepers' Association. She is also a "Mountainsmith Brand Ambeesador." See her work on Facebook, Instagram and Twitter (@sarahBeeGirl). Her hashtag is #loveyourbees. Staff research associate and Charley Nye of the Harry H. Laidlaw Jr., Honey Bee Research Facility/UC Davis Department of Entomology and Nematology, who staffed the habitat table, where the children learned about where the bees live. Zoe Anderson, a UC Davis undergraduate student majoring in animal biology, assisted with the honey tasting. 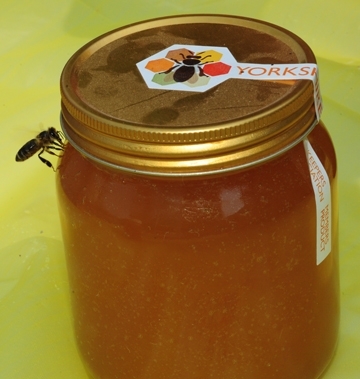 The youths all agreed they liked Sarah's vetch honey the best. The Echium wildpretii is commonly known as "The Tower of Jewels" but it ought to be known as "The Tower of Beauty." That's especially when honey bees gather to collect the blue pollen and sip the sweet nectar. Or when their wings glisten in the early morning sun. Or when it's National Pollinator Week. In our family, we call it "The Christmas Tree" due to two reasons: its height (it's as tall as a Christmas tree) and due to its spiked red blossoms, the color of Christmas. The plant, in the family Boraginaceae, is biennial and it can reach 10 feet in height. You often see its purple-spiked cousin, the Pride of Madeira (Echium candicans) growing wild in Sonoma, along the roads to Bodega Bay. The species is endemic to the island of Tenerife. There they call it "Tenerife bugloss." Whatever you call the plant, it's good to see it racing up the popularity scale as gardeners seek it for their pollinator gardens. There's even a Facebook page, "We got an Echium through the winter." Echium wildpretii is that pretty. A huge financial loss: this is an example of the damage a bear can do in the bee yard. (Photo courtesy of Jackie Park-Burris, Palo Cedro)Yes, bears raid honey bee colonies. But it's primarily for the bee brood, not the honey. The brood provides the protein, and the honey, the carbohydrates. For beekeepers and commercial queen bee breeders, this can wreak havoc. Financial havoc. The American Beekeeping Federation, headed by Gene Brandi of Los Gatos, recently asked Extension apiculturist emeritus Eric Mussen of the UC Davis Department of Entomology and Nematology to respond to a question about bees and bears. 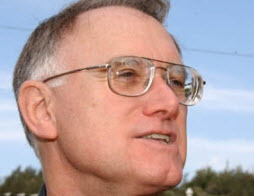 Mussen, who retired in 2014 after 38 years of service (but he still remains active from his office in Briggs Hall), is from Minnesota, where the bears are and he isn't. He's managed to photograph a few bears, though, on family outings to Lake Tahoe. We thought we'd share his response about bees and bears. Jackie Park-Burris of Palo Cedro, who owns Jackie Park-Burris Queens, kindly let us post some of her photos so our readers can see what bear damage looks like. A past president of the California State Apiary Board and the California State Beekeepers' Association, she's a member of the noted Homer Park beekeeping family and has been involved with bees all of her life. She's been breeding Park Italian queens since 1994. "Bears eat both meat and plants (berries) etc. whenever they can find them," Mussen says. "Most people think that a bear has a sweet tooth, since it is attracted to beehives. While it is true that bears will eat some honey if it gains access to a hive, a closer look shows that it will eat all of what we call 'brood' first, and then eats a little honey." Eric MussenMussen describes bee brood "as made up of bee eggs, larvae, and pupae." Since the queen may be laying between 1000 and 2000 eggs a day, "quite a bit of brood can accumulate before the end of the 21-day period that it takes to complete development from egg to adult female worker bee (24 days for the drones)." "Bears have a pretty good sense of smell, so they can smell a beehive if they get downwind of a nearby colony," Mussen points out. "If the colony is living in a tree, often the bear literally tears the tree apart to get to the bees. Unfortunately, they will claw and dig into a man-made beehive, as well. They leave the covers scattered all over; the hive boxes scattered and often broken; the combs pulled out, broken, and strewn about in the apiary; and the combs that had brood in them will have the comb eaten out. The colony will not survive and there may be very little undamaged equipment to salvage." "To a small-scale beekeeper," Mussen says, "the financial loss is not too severe. However, losing the colony, that requires so much effort to keep healthy these days, is quite a blow. For commercial operators, who may not revisit the apiary for a couple weeks, it can mean a very substantial economic loss." "The correct type of well-maintained bear fence usually is very effective at keeping bears away from the hives. However, that holds true only for situations in which the bear has not had previous positive experiences ripping apart man-made beehives. In that case, the bear expects a substantial reward for barging through the stinging fence and getting into the hives." What to do? "Most beekeepers have no desire to kill bears, but they do desire to keep their colonies alive," Mussen says. "Often, attempts are made to capture the offending bear, tag it, and move it away far enough that it should not return. Some of the wildlife specialists marvel in how far away a bear can be taken away and still return. Bears that cannot stay away from apiaries, or away from people's houses, or away from trash containers, etc., sometimes have to be eliminated. It is best to have this done by agency personnel, but sometimes in remote areas the beekeepers get deprivation permits and kill the bear themselves. In Northern California, the beekeeper has to notify the wildlife people of the kill, and the carcass has to be inspected to be certain that specific, black market body parts have not been removed from the bear. The carcass then is buried in a landfill, or once in a while used in institutional food." Occasionally Bug Squad hears of bears raiding honey bee hives in rural Solano County. 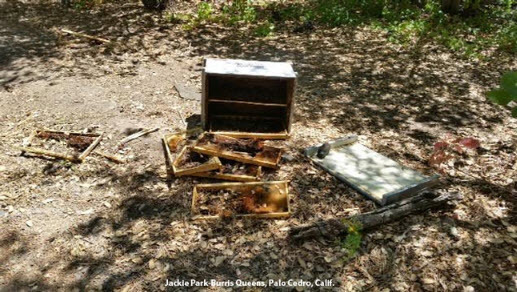 We remember a story about a beekeeper/queen breeder in Mix Canyon, Vacaville, who was losing his hives to a "wild animal." The loss? Reportedly about $30,000. He set up a stealth camera and....photographed a 300-pound black bear. "Bears have a pretty good sense of smell," as Mussen says, and the result can be "a very substantial economic loss." 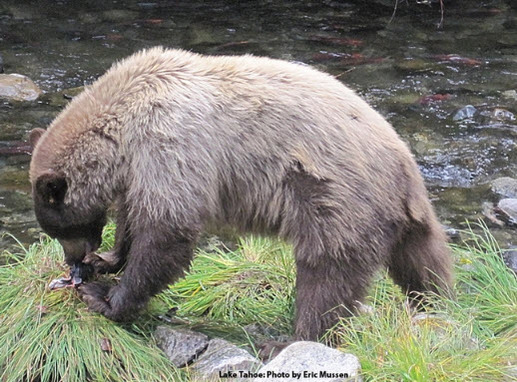 This image of a bear snagging fish was taken at Lake Tahoe by Eric Mussen, Extension apiculturist emeritus, UC Davis Department of Entomology and Nematology. He's been answering questions about bears and bees for more than three decades. A honey bee "stands upright" to reach the nectar on a Photinia blossom. 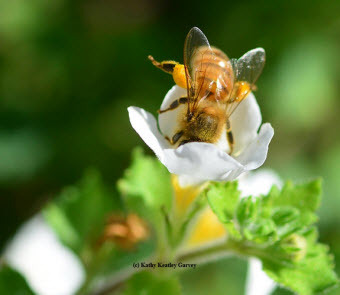 (Photo by Kathy Keatley Garvey)How often do you see a honey bee "standing upright" to reach nectar? "Well, I guess I could just buzz up there and grab some nectar! But why not stay right here where I am and just s-t-r-e-t-c-h like a giraffe to get it?" This bee, foraging on a Photinia blossom, almost looked like an athlete in training. Was she stretching to "warm up?" Was she stretching to improve performance? Flexibility? Mobility? Me thinks she was just taking a short cut to the sweet stuff and being a little territorial as other bees buzzed around her. Okay, I'll buzz over to it! (Photo by Kathy Keatley Garvey)Our honey bee will return to the hive where workers will process the nectar into honey. Humans will get some of it, too. If you'd like to sample honey--and mix with entomologists--mark your calendar for Saturday, April 22 and "bee" at Briggs Hall for the annual honey tasting, just one part of the 200 some events at the 103rd annual UC Davis Picnic Day. It's an all-day campuswide open house aimed to educate, inform and entertain. Why Honey Is Neither Bee Vomit Nor Bee Barf! There's something about a honey bee foraging on a flowering quince that makes you long for Valentine's Day and the end of winter. Flowering quince (Chaenomeles sp.) is one of the first flowers of the year to bloom. And bloom it does, in between the rain drops and rays of sunshine. It's a delight to see the honey bees buzzing in and out of the delicate pink flowers as they tightly pack their yellow pollen for the trip back to their colony. Protein for the bees. They're the real winged cupids of Valentine's Day, not the baby with the bow and arrow. Wikipedia says of Valentine's Day: "The day was first associated with romantic love in the circle of Geoffrey Chaucer in the High Middle Ages, when the tradition of courtly love flourished. In 18th-century England, it evolved into an occasion in which lovers expressed their love for each other by presenting flowers, offering confectionery, and sending greeting cards (known as valentines). In Europe, Saint Valentine's Keys are given to lovers 'as a romantic symbol and an invitation to unlock the giver's heart,' as well as to children, in order to ward off epilepsy (called Saint Valentine's Malady).Valentine's Day symbols that are used today include the heart-shaped outline, doves, and the figure of the winged cupid. Since the 19th century, handwritten valentines have given way to mass-produced greeting cards." Remember those traditional Valentine's Day cards? The UC Apiary Newsletter is Smokin! If you're looking for the newsletter, from the UC apiaries, it has a new home. The new UC California Cooperative Extension apiculturist, Elina Lastro Niño, has moved it to her website now that EricMussen has retired. Mussen, now Extension apiculturist emeritus, wrote the newsletter from 1976 to 2014 and loaded it on his UC Davis Department of Entomology and Nematology website. The editions are now archived. The new home? It's on the elninobeelab website. It's available online for free, of course. The newsletter is published bimonthly: in February, April, June, August, October and December. Niño relates: "If you wish to have this newsletter sent directly to your email address, please follow the instructions below. Enter this URL into your browser: https://lists.ucdavis.edu/sympa/subscribe/ucdavisbeenews. When it opens, it should relate to subscribing to this newsletter. Enter your email address and then click submit. It is time to decide whether to continue your hard copy subscription. The mailed subscription rate is now $25 per year (six issues). If you'd still like to continue this subscription please send a check by April 10, 2015 payable to the UC Regents and mailed to Elina L. Niño at the address in the signature block. Be sure to include your name and mailing address. If the check is not received you will not receive the next issue of the newsletter as a hard copy. This, of course, does not apply to those who have already prepaid for a certain time period." In the newest edition, published today, you'll learn about how to treat those nasty Varroa mites, known far and wide (except in Australia, which doesn't have them) as beekeepers' Public Enemy No. 1. Niño writes about HopGuard® II, "basically an 'old' product developed by BetaTec Hop Products, Inc., but it has an improved delivery system." some great information about how honey bees collect nectar. 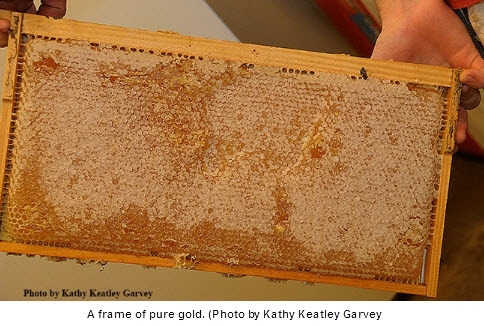 How honey bees collect nectar is her Kids' Corner feature. "Usually after about three weeks of life as a house bee, all healthy honey bees in a normal, healthy colony become foragers," she writes. "They start every morning by going out into the world looking for the best sources of sugary nectar and protein-rich pollen. Some of them even collect water. Now, I'm sure you've seen these friendly ladies just buzzing along visiting flowers in your back yard. By the way, just a reminder, forager bees will not attack unless they feel threatened so just make sure you don't bother them and you should be fine (and tell your friends too!). " Niño, who joined the UC Davis Department of Entomology and Nematology on Sept. 1, 2014 from Pennsylvania State University—2600 miles away--is as busy as the proverbial worker bee. “California is a good place to bee,” she told us recently. “I just wish I could have brought some of that Pennsylvania rain with me to help out California's drought." Niño operates her field lab at Harry H. Laidlaw Jr. Honey Bee Research Facility on Bee Biology Road, west of the central campus, and at her lab in Briggs Hall, on the central campus. Her aims: to conduct practical, problem-solving research projects; to support the state's beekeepers through research, extension and outreach; and to address beekeeper and industry concerns. The mission of her program is "to provide support to California beekeepers and other relevant stakeholders through research, extension and outreach." Niño studies honey bee biology, health, reproduction, pollination biology, insect ecology, evolution, genomics and chemical ecology. Check out her lab's website at http://elninobeelab.ucdavis.edu/; and her Facebook page at https://www.facebook.com/elninolab. Her email is so easy to remember: elnino@ucdavis.edu. Honey Bees, Kathy Keatley Garvey, Project Apis m.
"Spring is the busiest time of year for honey bees, and their keepers, whether the operation is in the desert uplands of southern Arizona, the citrus groves of Florida, or the apple orchards of Washington state," writes entomologist/bee expert Stephen "Steve" Buchmann in his book, Honey Bees: Letters from the Hive. Lately we've been watching honey bees collecting pollen from mustard, Brassica. The amount of pollen they collect is truly amazing. Each honey bee colony collects an average of 20 to 40 pounds a year, Buchmann writes. Buchmann, the author of The Forgotten Pollinators, The Bee Tree, and other books, will soon release his next book, The Reason for Flowers: Their History, Culture, Biology, and How They Change Our Lives, in July. Buchmann, an adjunct professor in the University of Arizona's Department of Entomology and Ecology and Evolutionary Biology, Tucson, and scientist-at-large for the Pollinator Partnership, San Francisco, received his doctorate in entomology from the University of California, Davis. He studied with major professor/native pollinator specialist Robbin Thorp, now a UC Davis distinguished emeritus professor of entomology. Buchmann's dissertation was on buzz pollination. There's an old saying "to cut the mustard," meaning that someone is good enough or effective enough for a task. The meaning probably originated from the military term "pass muster," but with honey bees, they're not only good at passing the muster and foraging in the mustard, they excel. Well, without pollinators, we wouldn't be celebrating Valentine's Day as we know it. That box of chocolates? Give thanks to the midges that pollinated the cacao tree, Theobroma cacao. That bouquet of mixed flowers? Honey bees probably visited them before they were gifted to you. Among honey bee favorites are lavenders, mints, sunflowers, asters, basil, rosemary and the like. That candle on your dining room table or fireplace? It may be made of beeswax, provided by the bees. But to paraphase John F. Kennedy, it shouldn't be about what bees can do for us; it should be what we can do for the bees. Two of the nicest things we can do are to (1) plant a bee friendly garden, offering a diversity of their favorite seasonal plants, (2) avoid pesticides and (3) learn about the bees around us and their needs. 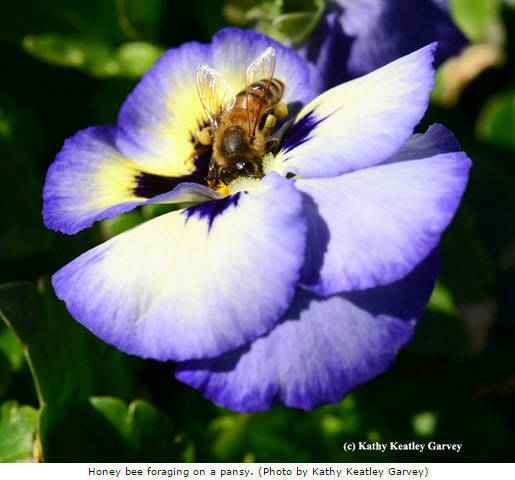 You can learn how to attract pollinators at a workshop set March 28 on the UC Davis campus. That's when the California Center for Urban Horticulture is sponsoring "Your Sustainable Backyard: Creating a Living Landscape." Registration is underway. Another perfect gift for Valentine's Day is the newly published California Bees and Blooms: A Guide for Gardener and Naturalists (Heyday), the work of Gordon Frankie, Robbin Thorp, Rollin Coville and Gretchen Ertier, all with UC Berkeley connections, and one with a UC Berkeley/UC Davis connection. That would be native pollinator specialist Robbin Thorp, distinguished emeritus professor at UC Davis, who holds a doctorate in entomology from UC Berkeley. As the authors point out, California is home to some 1600 species of bees. In their must-have book, they describe bee behavior, social structure, flight season, preferred flowers, and natural enemies. 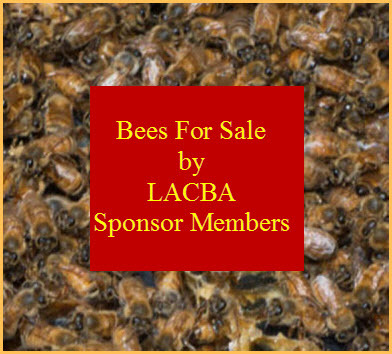 They offer "recipes" for bee gardens and list how you can become involved with projects that protect bees and promote public awareness. Can't you just hear the bees communicating "Bee Mine?" If you see a news story about "honey bees" in a newspaper or magazine, odds are you'll see it spelled as one word, "honeybees." That's because the Associated Press Stylebook, the journalists' "bible," spells it that way. So do dictionaries. However, in the entomological world, that's incorrect. "Honey bee" is two words because it's a true bee, just like "bumble bee." Similarly, you wouldn't spell "dragonfly" as "dragon fly" because a dragonfly is not a fly. The Entomological Society of America (ESA) governs the worldwide references to insects in its Common Names of Insects. If you want to know the common name, scientific name, order, family, genus, species and author, the ESA database provides it. Type in a name and a drop-down menu appears. Find the honey bee! 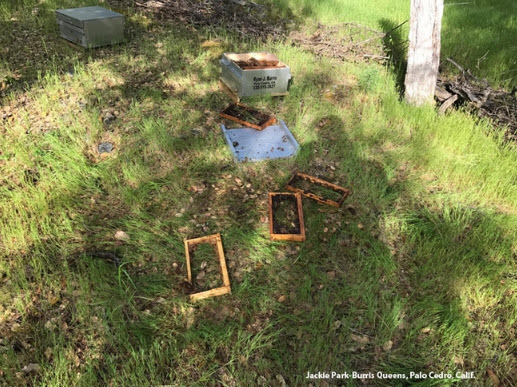 Extension apiculturist Elina Niño of the UC Davis Department of Entomology and Nematology writes about the misspelling in the Kids' Corner of her recent newsletter, from the UC Apiaries. "Since starting my new job at UC Davis, I have been corrected a few times for spelling 'honey bee' as two words rather than 'honeybee,' a single word. What do you think: which one is more appropriate?" She goes on to explain why "honey bee" is accurate. "Honey bees belong to an order of insects (a group of insects that have several similar features) named Hymenoptera which contains bees, wasps, sawflies and ants. You might even say they are 'true' bees and therefore, should be spelled as two words." In an article published in a 2004 edition of Entomology Today, the Entomological Society of America's communications program manager Richard Levine acknowledges that "Writing insect names using American English can be difficult. Some species have different names depending on where you are, or with whom you are speaking (think 'ladybug' or 'ladybird' or 'lady beetle'). More often than not, an insect may not even have an official common name because out of the million or so insects that have been discovered and described, only a couple of thousand have been designated with common names by the Entomological Society of America (ESA)." "To make matters worse," Levine writes, "even the ones that DO have official common names — ones that we see nearly every day — may have different spellings depending on whether they appear in scientific publications or other print media, such as newspapers or magazines." So the "bible" of journalists--or what the Associated Press sanctions and governs--does not always agree with the scientific "bible" of the entomological community--or what ESA sanctions and governs. "The reason for the discrepancy is that entomologists use two words if a common name accurately describes the order to which a particular insect belongs," Levine points out. "For example, all true flies belong to the order Diptera, so true fly names will be spelled using two words by entomologists — house fly, horse fly, pigeon fly, or stable fly, for example. However, despite their names, dragonflies and butterflies are NOT true flies — their orders are Odonata and Lepidoptera, respectively — so they are spelled as one word." As an aside, we wonder if the controversy over the spelling of "honey bee" extends to spelling bees. Would judges eliminate someone for spelling "honey bee" with a space in between? "H-O-N-E-Y (space) B-E-E?" Still, things can and do change. For years, the AP Stylebook editors insisted that "under take" is two words, not one. They've relented now, and it's one word, "undertake." Glory bee! Will the AP Stylebook follow the ESA's Common Names of Insects and decide it's "honey bee," not "honeybee?" Will the AP Stylebook give the honey bee some space? Just a little space? Stay tuned. Or stay buzzed. As temperatures dip throughout much of California, and honey bees snuggle inside their hives, it's "bees-ness" in southern California this week. C'mon iin, the pollen's fine! A honey bee reaching for pollen. (Photo by Kathy Keatley Garvey)Everything's abuzz as two national bee organizations host their annual conventions: The American Honey Producers Association (AHPA) is meeting for its 46th annual convention Jan. 6-10 in Manhattan Beach, Los Angeles County. And the North American Beekeeping Conference and Trade Show is underway Jan. 6-10 in the Disneyland Hotel, Anaheim, Orange County. 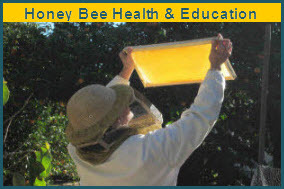 The topics will encompass bee health, including pests, pesticides, parasites, diseases, malnutrition and stress. Everything about the bee-leagured bees. Meanwhile, a few almond trees are blooming (one in the Benicia State Recreation Area burst into bloom before Christmas Day) and more and more bees are venturing out as the temperatures hit 55. If you have winter blossoms, odds are you're getting bee visits during the sun breaks. In our yard, the bees love the Bacopa, a groundcover that fought--and won--the battle with Jack Frost. Strong winds and rain storms hammered and stripped some of the blossoms, but the bees don't care. The pollen is there. A honey bee gathering pollen. In the foreground, a freeloader fly. (Photo Kathy Keatley Garvey)It's cool how honey bees and syrphid flies gravitate toward the Iceland Poppy. It's a winter plant, and frankly, there isn't much to eat out there. The Iceland Poppy (Papaver nudicaule), a bowl-shaped, papery flower, fills the bill. The name is a misnomer. It's not native to Iceland. It's from the cooler regions of Europe, Asia and North America, and the mountains of Central Asia. Botanists first described it in 1759.